Norway’s controversial regional reform plans were descending into utter chaos this week. Just as work on another of the biggest county mergers seemed to grind to a halt, however, the small but powerful Christian Democrats party declared that it stood by the reform project, and would continue to support it in Parliament. That means the effort to cut the number of Norway’s counties by half has been saved, at least for now. The groups working on mergers that, for example, will combine the counties of Buskerud, Akershus and Østfold into one large county called Viken must continue, even though a majority of officials within those counties now want to drop the whole project. Viken has been among the near-casualties of a highly irregular decision by officials in Norway’s two most northern counties of Troms and Finnmark to halt their merger process. A vast majority of residents of Finnmark, where the merger was highly controversial, made it abundantly clear in a referendum in May that they don’t want to merge with Troms. Then Troms decided that it couldn’t move forward with the state-mandated merger without cooperation from Finnmark. Their merger is thus stalled, despite orders from the government minister in charge, Monica Mæland, to move ahead on the mandate from Parliament. She worried that if Troms and Finnmark failed to merge it would jeopardize other mergers underway. Her fears are proving justified, and most think the whole process needs a re-start. It didn’t take long, after the Finnmark-Troms merger stalled, for the counties of Hordaland and Sogn og Fjordane to also get cold feet, and express various desires to back out of their formation of a new large county called Vestland. Even Trøndelag, which is the only new county that’s actually been formed by earlier northern and southern districts, started asking questions. If Finnmark and Troms could seemingly win an exemption to the state-mandated mergers, they wonder, why should they have been compelled to merge. Commentators and opposition parties in Parliament blame all the chaos around the regional reform process on the government. Newspaper Aftenposten editorialized on Thursday, as others have claimed before, that the reform process “started at the wrong end and has since grown worse.” Instead of defining which state functions the newer, bigger counties would take over, the government concentrated on geographical shape and size. “The goal shouldn’t simply have been bigger counties, but a more democratic structure and more efficient delivery of services,” Aftenposten wrote. Mæland won’t inform Parliament about which functions the government thinks the counties should take on until mid-October. Until then, even those counties that are cooperating with merger plans won’t know what content or duties they’ll have. 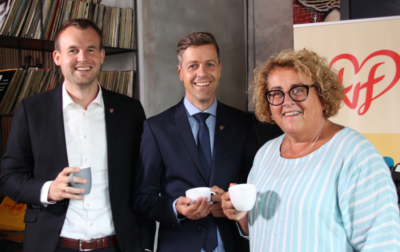 The government could at least be relieved when the Christian Democrats’ deputy leader Kjell Ingolf Ropstad declared on state broadcaster NRK this week that “of course” his party will support the reform process and see it through. He was quickly criticized, however, for not having declared such support earlier.